Thank you all so much for taking up the double Alice challenge over Easter. It was great to see how those Alice, rabbit and egg pieces moved into all sorts of other, sometimes dark, places! If you haven’t popped into the WEEK#37 do as there were some great ones towards the end! Now for this week I’m staying topical! Those historians among you will know that 23rd April is a special date for the English. It is St Georges Day and the date of Shakespeare’s birth and death. No doubt there will be lots of red crosses around and another excuse for a party over the week-end. If this is all a complete mystery to you, do look at ‘What is 100WCGU?’ for some clarification or get in touch. The link will close on 23rd April. Please make sure you visit the others and keep your pieces suitable to a PG certificate. Click here to enter your link. It will be transferred back here as soon as possible! Pingback: 100-Word Sonnet Challenge, 4/20 Version: Smoke Break | Even More BonusParts! Were we supposed to have written about a picture of George slaying the dragon? Didn’t see any link to that – sorry! Also, your instructions might be mis-interpreted to mean 14 lines is the minimum you can write (for anyone who isn’t familiar with sonnets) – whereas I think what you meant is Rule 1 is the minimum you must achieve – you can ignore rules 2 and or 3 – ? Hi, Julia, I just realized, as I did the Linky thing, that I didn’t put the 100WCGU image on my post, nor did I title my Sonnet. When I was done writing it, all I wanted to do was publish — no messing around or adding other stuff! Sorry! 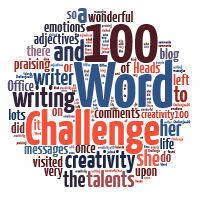 Pingback: 100-Word Challenge: Daddy and the Dragon | Even More BonusParts! Guess I’ll have to pass this week as this is beyond me too but I’ll be watching to see the results. Excellent! See the 100WCGU makes you young!! Crikey Julia! A great challenge and one that requires some thought. I will enjoy attempting this one! Wow, I haven’t tried writing poetry – let alone a sonnet! – since university…! But, I’m going to try. You certainly do know how to keep our minds stretching, Julia! Give this week’s a try? This is also beyond me – can we go back to regular writing prompts for a little while? I’m interested to see what others are positing. You can do 14 lines! That’s all you need!